It seems Iran's leaders have very different opinions about what sparked recent anti-government protests. 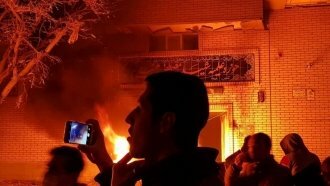 It seems Iran's leaders have different opinions about what sparked recent anti-government protests. Supreme Leader Ayatollah Ali Khamenei said in a series of tweets Tuesday he thinks Iran's foreign enemies orchestrated the unrest. He said, "Once again, the nation tells the US, Britain, and those who seek to overthrow the Islamic Republic of Iran from abroad that 'you've failed, and you will fail in the future, too.'" But according to local media, President Hassan Rouhani said Monday the demonstrations were fueled by citizens' social, political and economic demands. Twenty-two people were killed, and hundreds were arrested during the protests, which started in late December. As Newsy previously reported, the protests were originally focused on economic issues, like rising prices of food and gas. But the demonstrations eventually shifted to a more general outcry against the government.